What's Your Favorite Arizona Destination? If so, share it with the world! I tried, but found it impossible to choose just one favorite Arizona destination. Of course every attraction has its own reason for making the list, so it's really like trying to compare apples to oranges. I Decided To Create A Top 10 List Instead. And, of course, I'll give you the reasons each Arizona destination was chosen. Even then, I had to settle on leaving the list in no particular order. Yes, I know, it's a cop-out, but maybe being drawn to varied adventures and activities explains why I'm so attracted to this style of travel to begin with. Check out these photos from our 4 recent trips to Arizona destinations and see for yourself why narrowing down the top 10 list posed a challenge for me. In the northern part of the state, this very photogenic Arizona destination is located just off highway 89 a few miles south of Page. It's a short easy half-mile walk from the parking lot, yet it gets relatively few visitors, probably because its location is not very well marked from the highway or on the maps. The fact that it's easy to access and yet not overrun with people is one of the things that makes it a favorite. Another photographer's delight, The Wave, is not as difficult to get to as you might have thought. We had seen pictures of this splendid area of colored eroded rocks that's called The Wave, but we had also been told that this northern Arizona destination is very difficult to get to. We were pleasantly surprised to find out that's not true. The fact is, that although access to this fragile area is limited to 20 people per day, 10 of the permits are issued to "walk-ins" and the permit cost is only $5.00. 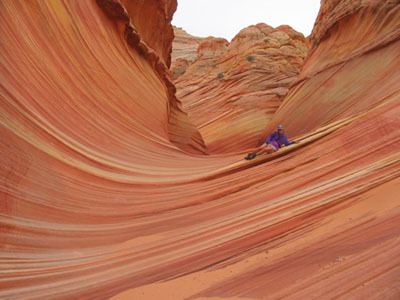 The area covered by the hiking permit is called Coyote Buttes and the formation known as "The Wave" is only one small part of the area. It's a 6-mile round-trip moderate hike but there's so much more to see than just this magical formation known as The Wave, so plan to spend the entire day exploring. 10 permits per day can be reserved in advance via the Internet. You can imagine that these are all reserved, almost as soon as they are released 3 months in advance. So, yes, a reserved permit is difficult to obtain. The other 10 permits, however, are issued only in person, a day in advance, at the nearby Kanab district BLM offices in Utah. YOu will need to be at the Grand Staircase-Escalante National Monument Visitor Center in Kanab, Utah beteween 8:30 and 9:00 am to apply for a next-day permit. If there are more than 10 people wanting permits, they hold a lottery to decide who gets them. At worst you may have to show up again the next morning. It's worth it! From mid-March to Mid November, walk-in permits can be obtained seven (7) days a week.From mid-November through mid-March, only from Monday to Friday (except for federal holidays). During those months, the permits for Saturday-Monday are all drawn on Friday. We've been there twice, both times in April. In 2004 there were only 7 others applying for a permit that day, so we had no problem at all. In 2008 we went back two days in a row and weren't so lucky. The good news is that each day that you show up, you're given an additional "ball" in the lottery tumbler, so your odds increase each day. The other good news is that there's lots to see and do in the area, and there's free camping nearby, so coming back a few times for the draw is doable. Although Coyote Buttes management area is part of the Paria Canyon/Vermillion Cliffs Wilderness Area in Arizona, you need to access it via Utah from a narrow dirt road off Hwy 89 called House Rock Road. There's no marked trail but easy-to-follow directions are provided with your permit. As much as we're frugal and, in a way, resent having to pay for hiking, these controls guarantee that we can enjoy the beauty of this hike in relative solitude and quiet - a major contributing factor in making it onto the top10 list. 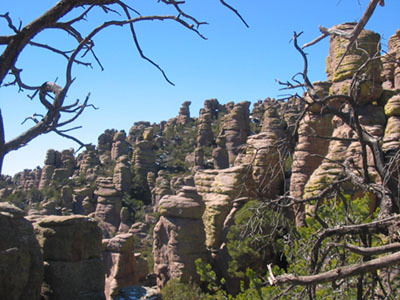 Chiricahua National Monument is another favorite southern Arizona destination. ust one of the many features, that make it stand out as a favorite for us, is the free shuttle bus, which takes hikers to the trailheads. This allows us to hike one way (down hill) through this wonderland of rocks and back to the visitor center. A tropical resort town is a welcome respite in the dry deserts of southern Arizona. 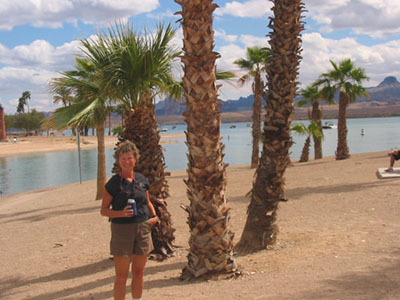 This resort town in the desert was built around the reservoir created by Parker Dam. As artificial as its creation was, the beauty and appeal of this much water in the desert, against a most scenic rocky backdrop, cannot be denied. Cayon de Chelly is definitely worth the trip into northeastern Arizona. 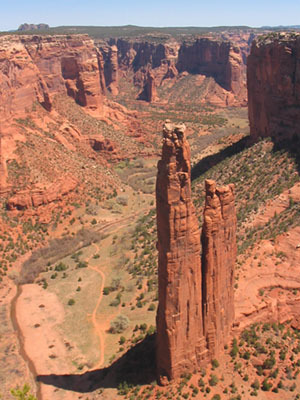 Canyon de Chelly is one Arizona destination that gets fewer visitors because of its location - being way up in the northeastern part of the state. It wasn't until our third visit to Arizona that we decided to put in the miles and check it out for ourselves. After seeing the amazing cliff dwellings, and the beautiful canyon itself, we would definitely make the trip again, and there's no question about putting it high on our top 10 list. 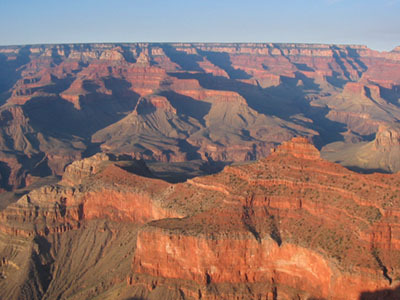 Arizona's most visited attraction is, of course, Grand Canyon National Park. Of course no other canyon can compare with the most visited Arizona destination: The Grand Canyon. Here's another 'travel where the wind blows' secret. If hiking and camping in the canyon is on your wish list, don't let the need for reservations months in advance discourage you. By arriving early in the morning at the backcountry office in Grand Canyon Village, depending on the time of year and if you're flexible, there are usually some cancellations you can fill. Also a small number of main corridor campsites are kept for walk-in bookings, so you usually can get a night or two arranged without any problem. Navajo National Monument is off the beaten path. Finding attractions such as Navajo National Monument will give every traveler incentive to get off the beaten track and see the real Arizona! A little out of the way but well worth the trip, this park is a delightful find. 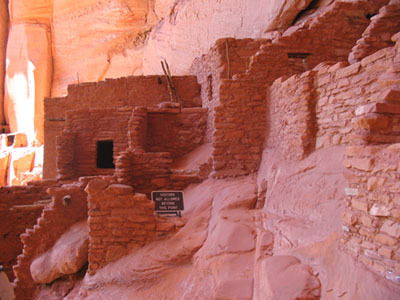 Set in just one more majestic scenic canyon, the friendly Navajo park staff and the daily free guided tours of this well-preserved cliff dwelling - Betatakin, make this park one of our sure favorites. Nature's version of a waterslide at Slick Rock State Park. Do you like waterslides? 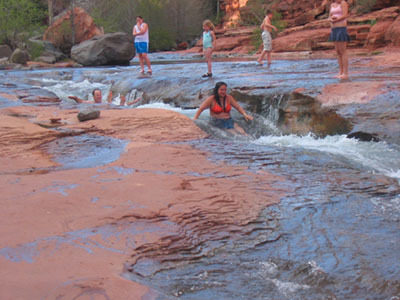 If so, you're bound to have fun in this waterslide created by nature at Slick Rock State Park, just north of Sedona. In the gorgeous setting of Oak Creek Canyon, the park offers unsurpassed scenery but the unique waterslide feature is what influenced me to put the park on the top 10 list. One of multiple spectacular views in Sedona. 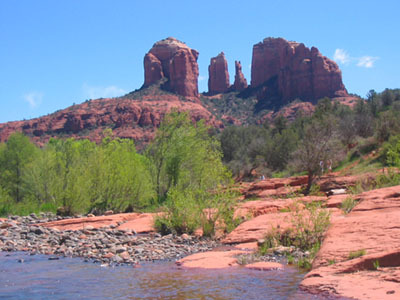 See photos of our 2008 adventures in Sedona. Almost too popular, this Arizona destination should have been reserved as parkland. It has become so coveted as a place to live, that the high price of property ownership serves to exclude most people. With a moderate climate and unsurpassed scenery, it's easy to see why this has happened. Even if we can't dream of retiring here, the popularity of this location cannot take away from the absolute beauty. We hiked many of the trails here and decided that Doe Mountain is among our favorites. It's not one of the most popular trails, but the .7-mile hike to the top is a moderate climb of only 400 feet and the payoff in relation to the effort is fantastic! The wide top of the mesa gives plenty of area to explore with various great views of many of the other prominent Sedona rock features in every direction. A hint for Sedona hiking: Since most of the trailhead parking lots hold only a dozen cars or so, parking is at a premium. Often waiting for someone to come off the trail is the only way to get a parking spot. Again, this feature, as aggravating as it can be, self-regulates the number of people who are on the trail at any one time. And, in an area as popular as this, that's something we came to appreciate. 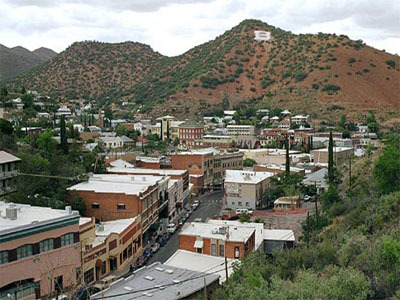 Bisbee, Arizona ... I could picture myself living here. 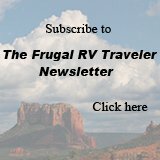 One of the most unique and best boondocking experiences we've ever had is just east of Bisbee at Belle Starr's Silverado Ranch. As far as a town goes, Bisbee has got it all goin' on for me. A friendly, community made up of retired miners, old time residents, artists, aging hippies, and retiring baby boomers from all over the country. This mix guarantees almost anyone could fit in here. Unlike some areas of the state, this Arizona destination claims the best year-round moderate climate ... no snow, and no extreme desert heat. Now wait a minute ... How can that be? 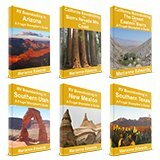 I've run out of numbers and I haven't even mentioned Saguaro National Park, The Superstition Mountains, Monument Valley, and Organ Pipe National Monument. The list could go on and on. I guess, when it comes to favorite Arizona destinations, limiting myself to 10 wasn't the best idea. 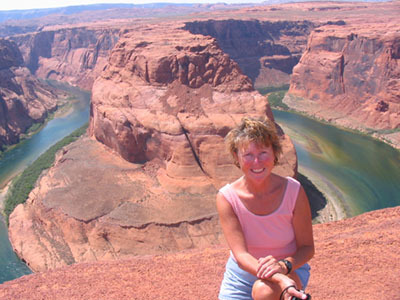 Post your own favorite Arizona destinations and see what other visitors have submitted. See photos of our latest Arizona travels.